The tragic death of Alan Kurdi, the three-year-old Syrian boy found washed up on the shores of Bodrum, Turkey in 2015, grabbed the world’s attention. Calls for a solution to the refugee crisis filled the news cycle. Two years later, the plight of the world’s 65 million forcibly displaced people remains. Sprawling refugee camps in Jordan, Kenya, Uganda, and South Sudan are testament to the permanent nature of the crisis. Low-to-middle-income host countries are disproportionately affected. Their already-limited resources strain to provide for refugees’ basic needs. 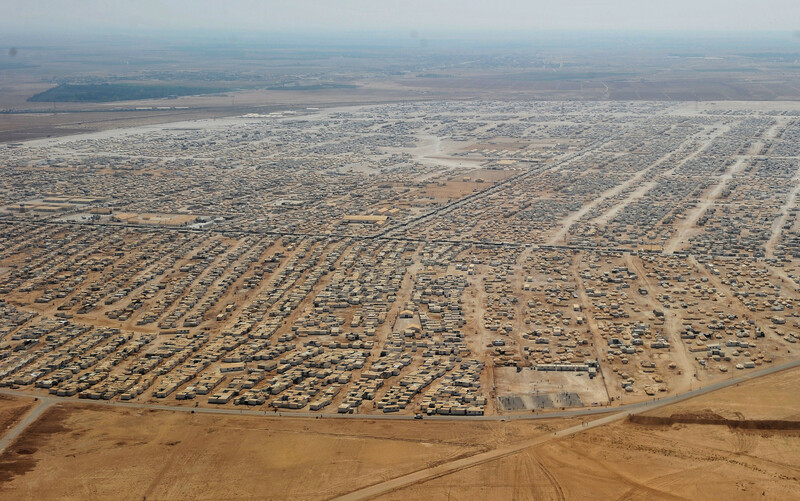 Za'atari refugee camp in Jordan is home to 80,000 displaced Syrians. A few refugee-hosting countries are exploring this approach. Kakuma refugee camp in northwestern Kenya was established in 1992 and has a current population of more than 184,000. If it were a city, it would be Kenya’s seventh largest. Kalobeyei, a new settlement a short distance from Kakuma, was established in 2015 to improve the conditions of refugees and host communities through an integrated approach. Low-income populations, both local and refugee, often have precarious wages and insecure living conditions. To understand their situation and needs better, Mastercard and Western Union researchers spent time in these two settlement economies. This effort, part of each company’s respective commitments to the Call to Action for Private Sector Engagement on the Global Refugee Crisis, led to the development of a “Smart Community” model for refugee settlements. By studying the needs of a particular refugee ecosystem and examining how interconnected aspects of its daily life are, from education to health to financial services, we can propose meaningful technology solutions. As a result, new payment, transaction, and data tools can be implemented to improve the delivery of essential services, whether provided by the private sector or non-governmental organizations (NGOs). Efforts could focus on a country like Uganda, whose refugee population increased by 68% to over 1.3 million in the last year. While the government maintains an open-door policy that gives refugees the right to work, a plot of land and access to health and education, among other benefits, significant resource gaps impede progress. Despite the best efforts of public and private humanitarian and development actors to provide support, the needs of the refugee population continue to grow. Low-to-middle-income host countries are disproportionately affected by the refugee crisis. Since the world’s wealthier cities recognize the value of technology and data to manage operations and advance inclusive growth for their own citizens, why not use such tools in refugee settlements, whose needs are arguably greater? Working together, we can deliver solutions to impact the lives of thousands of refugees and host community members, with the potential to replicate and scale to reach millions. Now is the time to reimagine the refugee camp. Let’s restore dignity and economic resilience to those who have already lost so much.